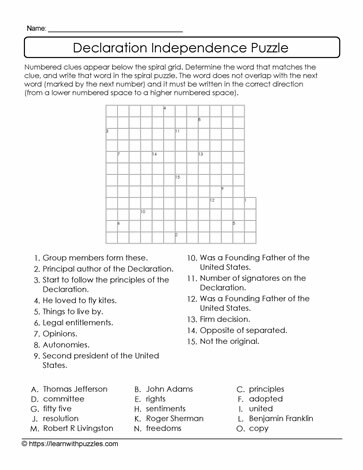 Declaration Independence puzzle with clues. Here is a printable spiral puzzle with Declaration Independence vocabulary. Determine the word that matches the clue and write that word in the spiral puzzle. This downloadable puzzle was created to engage students' problem solving and vocabulary building skills. Suitable for students in middle grades 5,6,7 classrooms and homeschooling environments. Differentiate, or adapt, instruction for earlier grades and ELLs.